By the year 1000 Italy south of Rome was a hodge-podge of Lombard duchies plus a number of small city-states such as Naples as well as various Byzantine provinces; there was also a massive Arab presence on Sicily and the southern mainland. Into this already complicated setting rode the Normans, only a few generations after wading ashore in France as the justifiably feared warrior-race, the Vikings. The nicest thing ever said about the Vikings was that, yes, they were ferocious, cunning and absolutely ruthless—completely given to pillaging and plundering—but not because they liked it! It was because they realized that ruthless pillaging and plundering was the most efficient way to get what they wanted: namely, the property and possessions of others. If the Vikings were only half as nasty as their reputation, it is little wonder that within 150 years of their first raids on Britain and the continent they had maneuvered the French king, Charles the Simple into the wise move of ceding to them in 911 the land in the north of France which would become known as Normandy, named for them, the Northmen or Normans. The real wonder of it all is that they decided to settle down, and even more wondrous was that in a few generations' time, all their fire and rage would be diluted by southern climes, and their empire in southern Italy would be known for its tolerance, culture and laid-back way of life. But that is precisely what happened. If you stand in front of the royal palace in Naples and look at the statues of the rulers of the city, Roger II, the Norman, is the first one (photo, above). He is the monarch who represents the beginning of modern history in Naples. He was the beginning of what might be called a European dimension in southern Italy. The feudal redistribution of land in Normandy had meant that a number of young Norman knights wound up with nothing, so they sought their fortunes elsewhere. By the early eleventh century, bands of them were already wandering around this area, fighting for anyone who would pay them —Lombards, Byzantines, the Papacy, the Dukes of Salerno, Capua or Naples. In return for helping the Neapolitan Duke, Sergio IV, in 1029, they were given the hill-fortress in Aversa with its dependencies, and that area soon became a jumping off point for Norman adventurers who wished to take part in the struggles going on for control of the south. In the middle of the eleventh century they were fighting for and against everyone, managing to take over piecemeal much of what had been Lombard land. By 1090 they had taken Sicily from the Arabs. The Papacy, originally glad to have Norman help against the Byzantines and Lombards, realized that the Norman tail was now wagging the Papal dog. Normans were raiding monasteries in Italy with as much abandon as had their Viking grandfathers a few generations before in Britain and France. The Normans consolidated their gains in a victory over the combined Papal forces of Lombards, Italians (from the Papal States) and German mercenaries at Benevento in 1054. The Pope as well as the Western Empire were forced to ratify Norman gains. It was a brilliant move by the Normans: they now pledged allegiance to the Church, in return for which, of course, the Papacy consecrated the Norman Empire in the South, now virtually all in Norman hands, anyway. By 1060 there were three separate Norman holdings: Aversa, Capua and Apulia, the last of which was the most important, because it was from there that the Normans, under Roger I, (Robert's brother) went on to take over Sicily and, by default, all Norman holdings in the South. Shortly after William the Conqueror had successfully invaded Britain, Robert, who saw himself as eventual lord of the whole Mediterranean went on to try and mop up the entire Byzantine Empire in Greece, and failed. His less ambitious sibling, Roger, stayed on in Sicily. Roger's third son became Roger II, and was crowned King of Sicily in 1130. The early article, above and below this green box, may have left the impression that the Normans who founded the Kingdom of Sicily were just happy-go-lucky warriors out on a quest to grab whatever land they could down south, and things just turned out the way they did. That is, the phrase "Robert of Hauteville arrived in 1047" requires some explanation. Here. than others. For our purposes, note that the island of Sicily and the bottom (the "boot"
Not to bury the lead, the salient point of this information is that, yes, the existence of Vikings was in a broad historical sense responsible for the presence of Norman knights in Sicily (that is, if A had not happened, then there would have been no B and no C). But the Viking expansion to the south is also NOT related in a narrower sense (see 1038 in the time-line below). Vikings were Scandinavians, Norse seafarers who raided and traded from their Northern European homelands across wide areas of northern, central, eastern and western Europe, during the late 8th to late 11th centuries. This mercantile and demographic expansion for 300 years is important in the early medieval history of Scandinavia, the British Isles, France, Estonia, early Russia, and -- here it is-- even Sicily. The period from the earliest recorded raids in the 790s until the Norman conquest of England in 1066 is commonly known as the Viking Age. Though not commonly associated with southern expansion into the Mediterranean, Viking presence on the Atlantic coast of Spain and Portugal was considerable, and later, their ventures farther into the Mediterranean were crucial in the history of Sicily and, consequently, southern Italy (eventually to become the kingdom of Naples). Many histories distinguish between Danes and Norwegians. For simplicity, since they generally acted in concert, I am calling them both Vikings (a word that actually meant "adventurer" in old Scandinavian languages. (The word, itself, may actually derive from a place name, Vik.) They generally referred to themselves as Norwegians and Danes. Below is a brief time-line of Viking and related activity that includes other relevant historical events and activities in the south. Those "other" events are in red like this. 1091: The Normans finish taking Sicily. That is the force that retook Sicily, an enterprise that was complete by 1091. Two lieutenants were prominent in the force that invaded Sicily: one was William de Hauteville, a Norman knight (see paragraph 3 main article above this box). 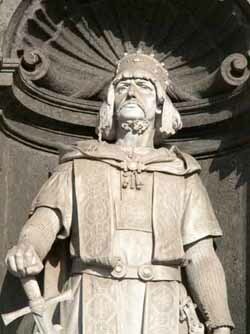 The other was Harald Sigurdsson, more famous as Harald Hardråde (1015-1066), the commander of the Varangian Guard. He was born in Norway and was actually on a 15-year hiatus from northern activities and had sold his services to Byzantium. After the collapse of the expedition in 1042, Harald went back up north and became king of Norway as Harald III, and died while attempting to invade England in 1066 (nothing to do with the famous Norman Invasion and Battle of Hastings that year -- England was simply getting roundly hammered on many fronts that year). The expedition may have collapsed in 1042 due to internal infighting, but it lasted long enough to land Norman forces on Sicily to begin to retake the island, a process that took half a century. They had help from the Lombards in Byzantine-held Apulia to the north. Harald's death in 1066 was well before the final battles to dislodge the Muslims from Sicily, mostly by the 1070s and definitively in 1091.
credit: The graphic in this box is from the European Council Cultural Routes website. Roger II marched north in a campaign to unify Sicily with the southern Italian mainland. He entered Naples in September 1140. Story has it that he got on the good side of his Neapolitan subjects immediately by calling them together and asking them how long the city wall was. No one knew, so he personally marched it off at 2,373 paces and announced that he was going to enlarge it for the good of Naples and it citizens. It was a strange end for the Normans. In the South they were victims — fortunate ones, perhaps — of their own flexibility. They started out as almost caricatures of themselves: ferocious, aggressive, asking no quarter and certainly giving none. They wound up as a blend of cultures, languages and faiths, a society apparently ruled by "an aristocracy of talent" (to use Thomas Jefferson's choice phrase) In hindsight, coming as it did on the eve of that atrocity known as The Crusades, their rule here seems to have been one of the last great periods of understanding and tolerance in European history, one in which there was a fortunate and rare reversal of the roles described by Yeats: This time it was not "the worst," but "the best," who were "full of passionate intensity."